This week you will learn about 3 things you may be doing right now or plan to do that will actually hurt your credit score not help it. As a potential buyer, you don’t want to mess up your credit score. But did you know that you might be doing just that! It can easily happen if you don’t understand the system of how credit scores get calculated, according to credit expert Eddie Johansson, president of Credit Security Group. What you think is helping it could actually be hurting it! Even if you’ve caught up with your payments that fact that you were late hurts your score. So don’t pat yourself on the back just yet … make it a point to pay your bills on time. Not even a day late! You can check your credit report to see which accounts report to the credit bureaus first if there is a time you must delay a payment. That way you know which ones are a priority. You can also contact a credit card company to see if they will work with you on your late payment and not report it to a credit bureau. Misconception 2: I’ll pay the highest bill first since dollar amounts matter in credit scores. In fact dollar amounts don’t matter in FICO scoring. The effect on your score is the same for a $1 late payment as a $1,000 late payment. Again, pay your bills on time. Remember that one component of your credit score is your debt-to-available-credit ratio, which is how much your owe on each account and how much credit you have. So keep your debt low (pay back in full if possible) but still accept any offers to increase your available credit (just don’t use it!). 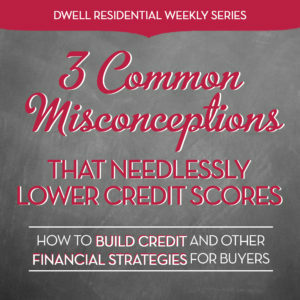 Misconception 3: I should close some of my credit card accounts to help my score. Canceling a card can actually hurt your score since having long-term cards shows lenders that you have a solid history of positive credit. That’s how they know you are creditworthy since you’ve handled credit well for many years. It’s best to keep your cards open and active, and use them for small purchases and pay off the balance each time. This is especially true if you’re close to applying for a mortgage since you don’t want to make any changes that could show up on your credit report. Still keep cards open even if you need to improve a low score. Don’t use them now but you can later once you’re back on track. And, that’s why you want to think carefully before you apply for any new card so you’re not in this situation in the first place! Next week is our last installment with The 10 “Credit Score” Commandments Homebuyers Must Follow.